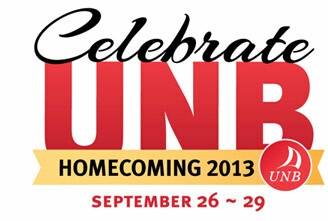 The University of New Brunswick will welcome students, alumni, and the community to the Fredericton campus as it celebrates UNB Homecoming 2013 from September 26-29. The four-day celebration has something for everyone, including a lobster boil, football rally and parade, Family FunFest, and Maritime Kitchen Party. Homecoming is a special time of year when alumni, students and the UNB community celebrate UNB. It is an opportunity to reconnect and reminisce, make new connections, share accomplishments and celebrate achievements. Homecoming 2013 will celebrate certain special reunions as well as the graduating classes ending in "3" and "8". All alumni are welcome to attend. Find out who has already registered, and see our full schedule of events. Visit unb.ca/homecoming for more information and follow the conversation on Twitter at #UNBHC2013.